If you are going to attend one art fair this year, Art Toronto is the one to go. 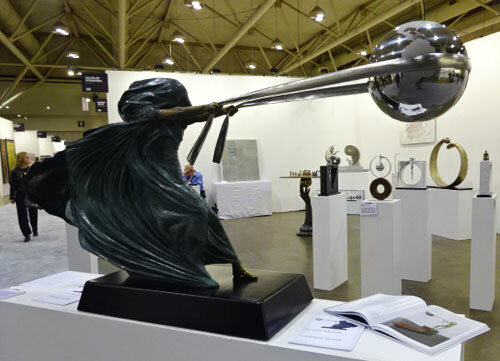 Taking place Oct. 24-27, 2014 at the Metro Toronto Convention Centre, it is Canada’s only international art fair for modern and contemporary art. With over 100 galleries from around the world showing art, it is an opportunity to see diverse and fascinating art all in one place. Here is a sample of this year’s dizzying, challenging, funny, clever and thought-provoking show. 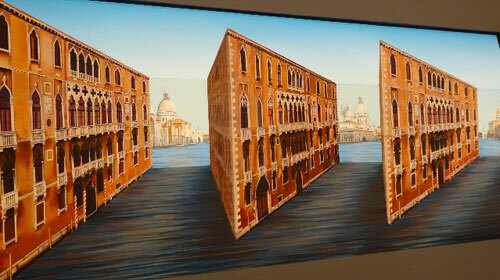 Patrick Hughes is the creator of “reverspective”, an optical illusion on a 3-dimensional surface where the parts of the picture which seem farthest away are actually physically the nearest. His paintings are mind-bending and mesmerizing, You’ll be walking back and forth, forwards and backward, up and down and may even try to turn yourself upside down to see how the painting moves with you. It can be discombobulating. Don’t worry about looking odd. We all do it. Patrick Amiot is a Canadian sculptor whose works link the Quebec 19th and early 20th century tradition to a contemporary pop/folk statement. It is impossible not to feel his sense his humour when looking at his pieces. Could you walk away without knowing what every part of the animal totem was made of? We were not satisfied until we figured it all out… the bird has locks for eyes, the dog has spades for ears and a mailbox for his nose. 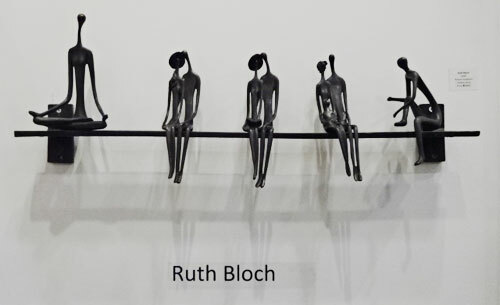 Ruth Bloch’s work exhibits a great depth of feeling for the human figure. 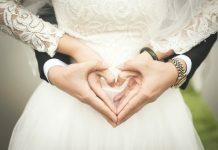 She reveals the unity of her masculine and feminine forces the connection of the human heart and emotion. Her art, portraying the human condition, leads me to wonder if we are always alone or are we always connected. 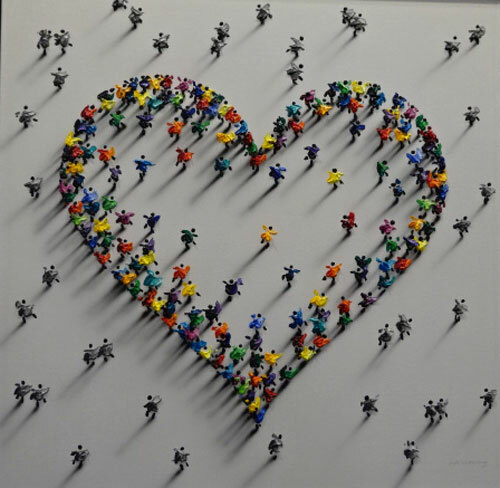 Jane Waterous’s trademark is three dimensional crowds at play, a celebration of the human spirit and the energy of gatherings. After having seen the ravaged coast of Thailand, Lorenzo Quinn created a sculpture dedicated to Mother Nature. This is reminiscent of the early statues made as peace offerings to the Gods in the hope of quenching their anger. This is a powerful piece that stays with you long after. Every time you hear “Force of Nature,” this is what you’ll envision. We have to wonder how he created this gravity-defying piece. 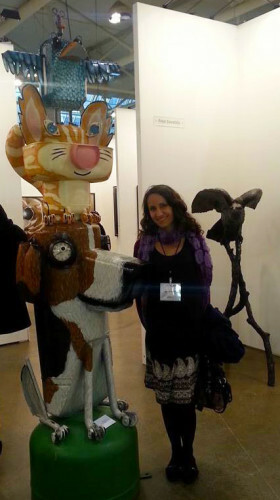 Aside from soaking up art, art shows are a great way to get to know people better, to build an intellectual rapport. My companion and I have a never-ending discussion of what is art, what art is worthy of attention and what art we would love to do. I captured a photo of my companion pointing at a statement he has often made. 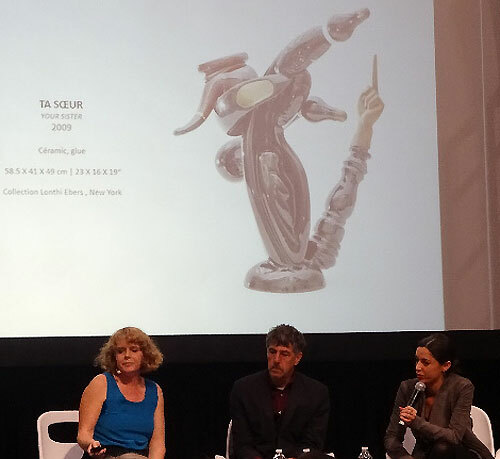 Talks and presentations by artists creates a vivid portrait of the artist and the creative process. It really deepens your understanding and appreciation of an artist’s work. Valérie Blass, a Montreal-based artist, talked with David Liss about her exploration of tensions between form, figure and materials. She discussed how she re-imagines and re-invents the present by borrowing from different sources and juxtaposes materials in a fascinating way. She mixes colour, pattern, texture and scale to create a new vision. 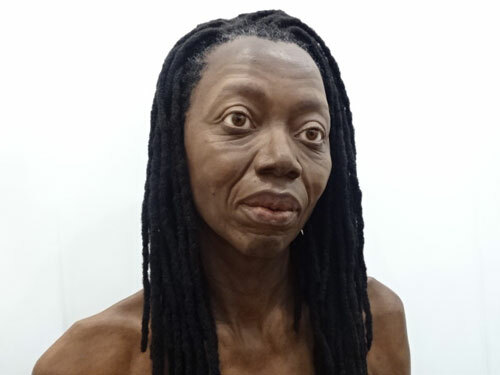 Evan Penny’s hyper-realistic sculpture is stunning. He positions every beauty spot and eyelash just so. It is natural to assume he is a very precise and meticulous person. However, at his 2012 exhibit at AGO, I learnt that he considers himself a very impatient person, one who is willing to be patient and submit to his discipline to pull off his artistry. 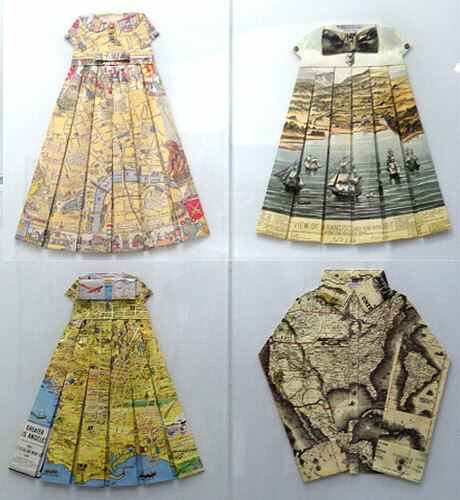 French artist Elisabeth Lecourt has made, by hand, a collection of apparel meticulously folded from geographical maps. Elisabeth decided to work with maps because of their poetic charm. I wondered how the roads we’ve travelled have shaped who we are or who we seem to be. Others, who had been to San Francisco, were fascinated how the map changed over time. 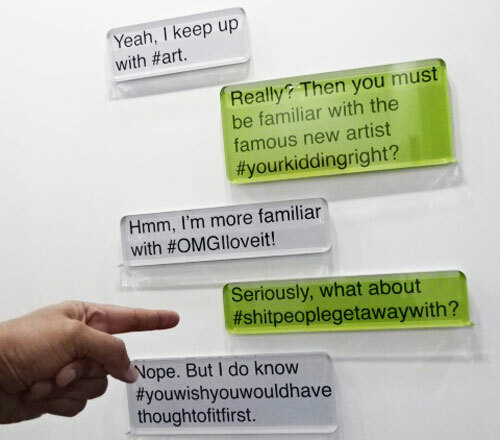 Art Toronto is a great show, no matter what your tastes. It mixes the silly with the serious, the light-hearted with the profound. There is so much art to see you might want to spread it over a couple of days. 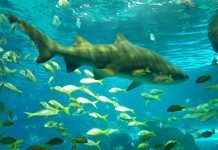 Hopefully, you have a chance to check it out every year.